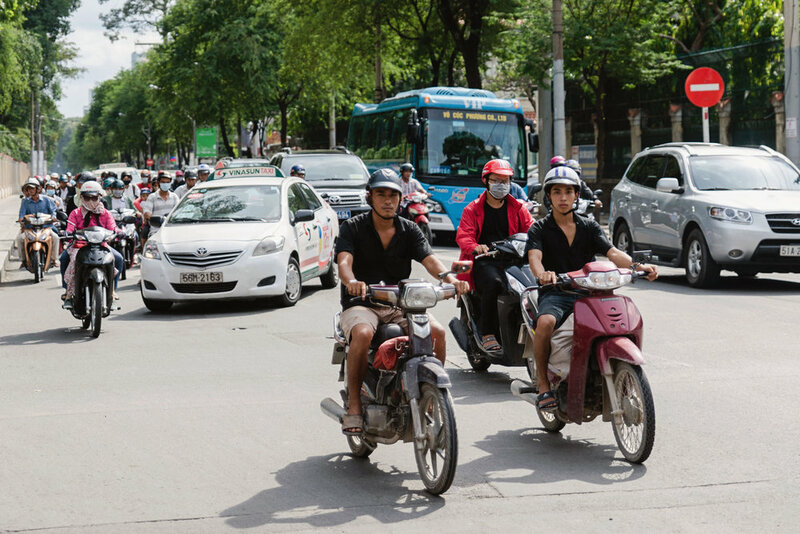 Our visit to Ho Chi Minh began with us suddenly having no place to stay. Catching a taxi from the airport, the driver decided to take quite a roundabout route, perhaps due to traffic, but it began to feel like he was milking the meter because it was more than a scenic route. Things went a bit more off course when The Town House 50 hotel/hostel staff told us that the hotel room we reserved was given to another guest due to a “problem in another room.” We weren’t informed or re-accommodated. So there we were that first evening with no place to stay. We were introduced to a place next door, one where the entrance was suspiciously through the back of a barber shop. Everything was too shady to say yes to the dingy room so we took off. With our backpacks on our backs, we began roaming the Ho Chi Minh streets going up to the front desks of any legitimate-looking hotel. Alas after a few tries, we found an available room at the centrally located A&EM 280 Le Thanh. 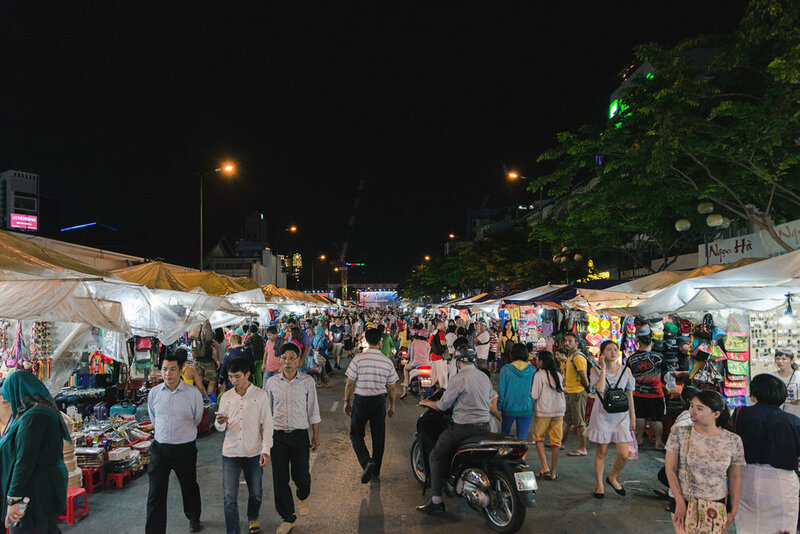 Our first stop was checking out Ben Thanh night market nearby, one of the most well known ones in the city. Set up like a flea market, the area is lively and booths sell everything from knock-off sneakers to random fashion items and toys. We grabbed some food - pho and spring rolls, of course - at a crowded random eatery where a Korean TV crew was filming. Ho Chi Minh, it seemed, was a popular travel destination for Korean tourists at the time. The biggest reason we decided to stay in Ho Chi Minh was to experience the Mekong River (I’ll write about the experience in the next blog). We booked a tour through The Sinh Tourist - if you do too, keep in mind that they require you to check in before the date of your tour. Most of the time in Ho Chi Minh was spent wandering different areas, checking out local markets while trying to stay dry from sudden thunderstorms. We went in September, which falls in their rainy season (May thru November), and it's no joke. You'll want to bring a rain jacket with you at all times as we had a perfectly sunny day suddenly turn into a puddle-hopping downpour in no time. 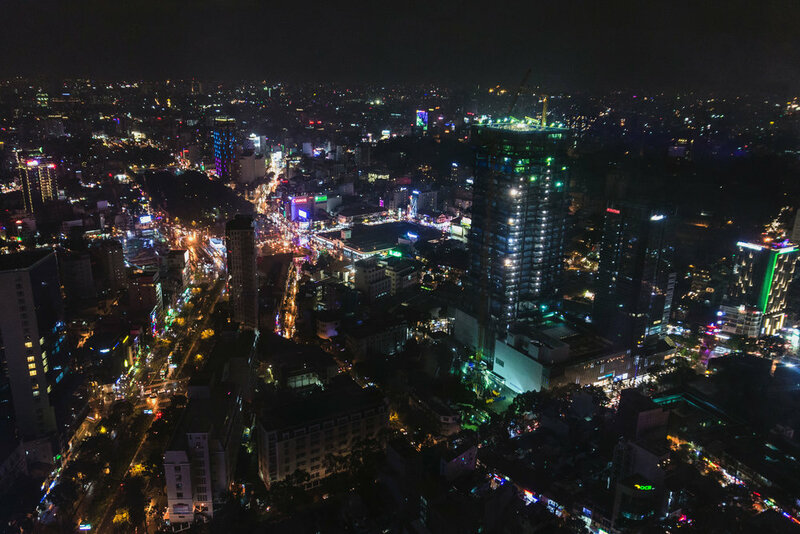 If you're looking for the best view of the city, head up to the modern Saigon Skydeck in the Bitexco Financial Tower (where the photo below and the top photo were taken). There's also EON Heli Bar which we stopped by, a modern lounge with views of the city. It can get really lively, full of tourists and expats, but the staff were helpful in getting us a seat. 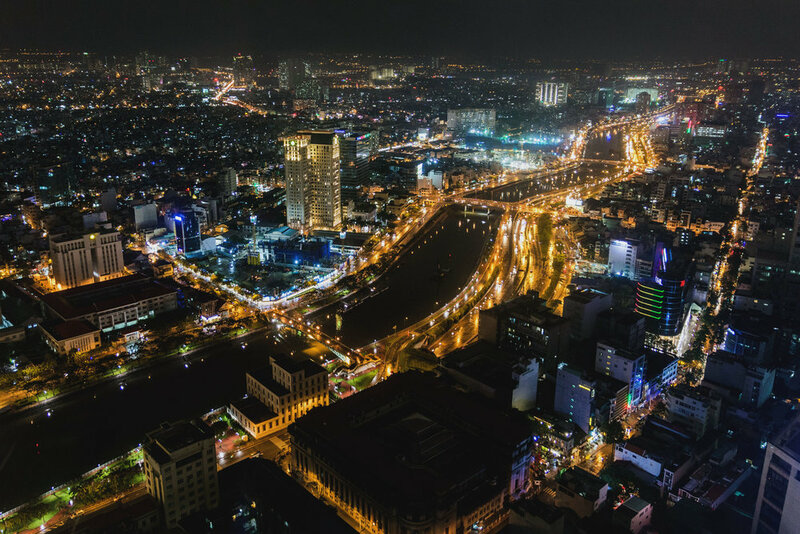 Ho Chi Minh is a spread out city, and places aren't as close as they may seem on the map. Luckily there are cafes and food shops here and there to stop by at. 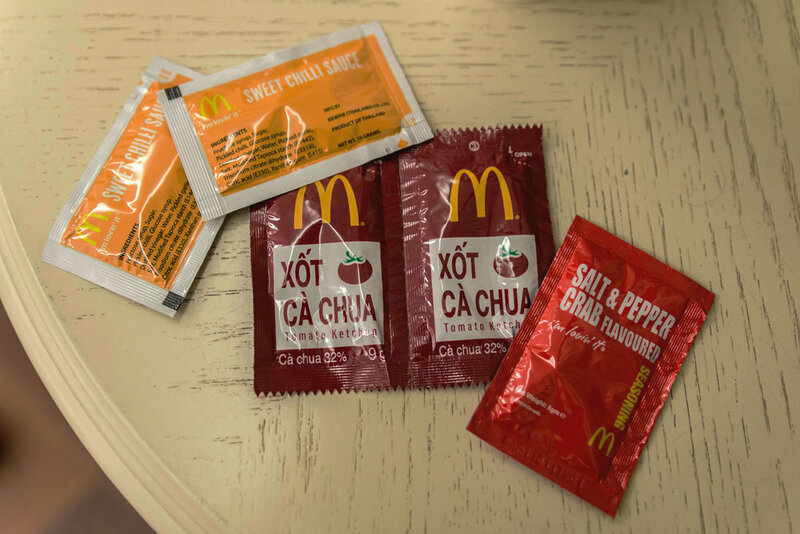 And McDonald's, of course! Just before heading the airport, we grabbed some coffee and finished our trip off with a massage in the Ben Thanh area, a place almost like a little Japan Town. Vietnamese coffee is really good, and even though it's a commercial chain, my favorite was found at Highlands. It's their version of Starbucks (try their Truyền thống/Traditional Blend and Di Sản/Heritage Blend) and they absolutely need to open up shops globally. If you're debating which is better for a first trip, Ho Chi Minh or Hanoi though, I recommend Hanoi. Here's why. A hole in the wall joint, Quan Thuy 94 Cu specializes in Vietnamese seafood dishes. 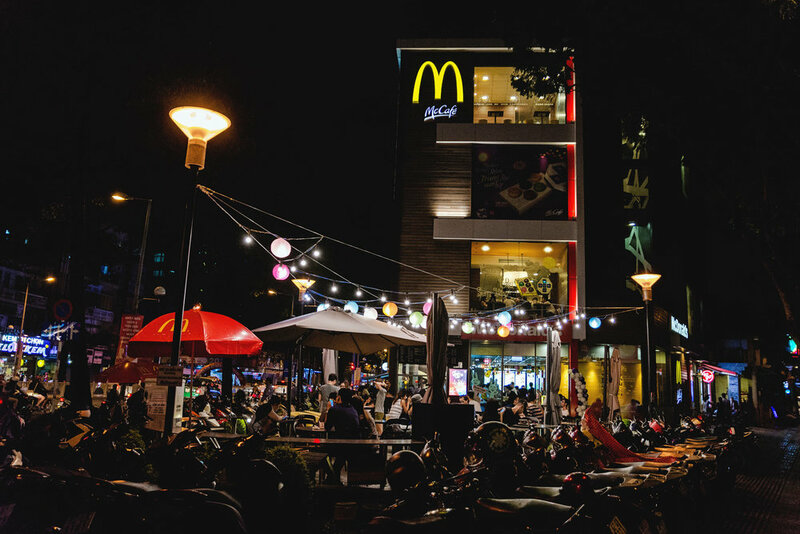 It's a really casual place, and while it's mostly filled with locals, you can tell that they're no stranger to tourists as well. Their crab fried rice definitely stuck out and they don't skimp on the crab. Definitely order it if you stop by. 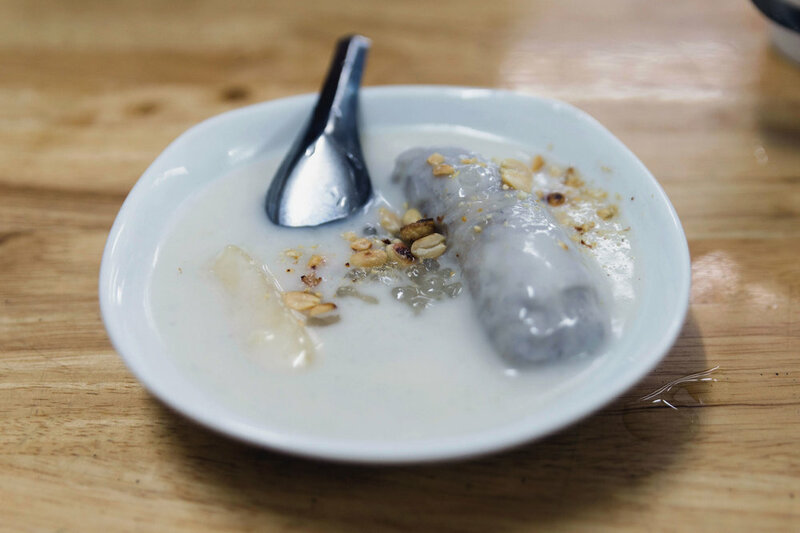 I didn't realize how refreshing Vietnamese desserts were until spending the day exploring. Che Nam Bo is perfect for a quick stop. It's laid back, nothing fancy, and has the vibe of a family business in the local neighborhood. Some sweets like the coconut flan are already prepared while others are made fresh when you order.